Just before leaving for work as an office boy at a Chinese dried foods wholesaler, Mr Frankie Gwee told his mother: "It's been a long time since I've been to a hospital." "I don't know how it happened. I wasn't speeding. I'd be finished if I were. It's as though someone blocked my vision," says the now 53-year-old. Because I had a leg-up, I told myself I must not forget people who are struggling or who are disadvantaged. MR FRANKIE GWEE, who has written generous cheques to many who needed help. In 2006, he donated $10,000 to the family of a man who was killed by an oncoming train at Chinese Garden MRT station. "Before the accident, I didn't have a very high IQ. I never imagined I'd have my own business," he says with a laugh in Mandarin. Because his father could give him only five cents for pocket money each day, the former pupil of Ngee Ann Girls' School - now known as Ngee Ann Primary - in River Valley often went hungry at recess time. "Walking to school made me thirsty so I'd spend the five cents on a drink. That left me no money for food at recess. I could only salivate while other pupils had noodles and fishballs. I was so hungry I sometimes ate their leftovers, I'm not kidding," he says. The rumblings in his stomach got so bad that he decided to play truant in Primary 2 so that he could earn a few cents and a meal or two by being a hawker's assistant. "In the morning, I'd hide my schoolbag in the bushes behind the Van Kleef Aquarium," he says, referring to the former tourist attraction at the foot of Fort Canning. "But one day, a gardener chanced upon my schoolbag and called the school, which in turn called my father. He gave me a thrashing." His employer provided food and lodging but Mr Gwee's day started at 5am and did not end until 11pm, seven days a week. "My father eventually came around. I earned $90 a month, and handed all of it to my mother who would give me $20 for expenses," he recalls. For the next decade, he worked as an assistant to various hawkers - selling everything from chicken rice and yong tau foo to bak kut teh and prawn noodles - in Clarke Quay, Chinatown and Orchard Road. After completing his national service, he found a job as an office boy for a wholesaler of shark's fin, abalone and other dried goods. "My spine cracked, my head swelled to the size of a basketball, my nose collapsed," says Mr Gwee, whose face was so smashed in that he could not talk and had to be fed through a tube for several weeks. He lost more than 20kg as a result. "When I could finally move and get out of my hospital bed on my own, the first thing I did was to go to the toilet and look in the mirror. It was like a scene from a movie; I was so stunned, I couldn't believe it was me." Madam Low, now 50, says: "We'd been together for half a year then, and I was very happy. I couldn't bring myself to leave him just because he had an accident. My friends and relatives asked me if I knew what I was doing. When we decided to get married, my father said, 'You picked your husband'." She adds: "He's also a good man and very hard-working. I knew I would be okay." "I looked so hideous that when my nieces and nephews came over, I'd just hide in my room because I didn't want to scare them," says Mr Gwee, whose countenance still looks a little frozen. "He pulled down the skin of my face and did a lot of things to realign my features," says Mr Gwee, pointing to the scar which goes up the side of his head and over his crown. "This right eye is badly damaged, there is no muscle to hold the pupil down, that's why it is there above my eyelid." While out one day with an elder sister Peck Hua -who was a bak kut teh chef in a hotel - he bumped into an old friend. "He asked us if we'd thought about setting up our own bak kut teh stall since both of us were not strangers to the trade," he recalls. "I thought it was a good idea; my sister thought so too." Word of Ya Hua's flavourful broth and friendly service soon spread; business was brisk. "We recouped our investment in one year," he says, adding that another sister Guek Hua also came on board as a partner. "Despite my accident, I have been really blessed. I married a good wife and have two very obedient children," says Mr Gwee, who has a 26-year-old son, Mario, and a 22-year-old daughter, Fiona. "Because I had a leg-up, I told myself I must not forget people who are struggling or who are disadvantaged." "Because I've not had an education, I wanted my children to finish university. But they told me they wanted to help me grow this business," he says, adding that he needed a lot of persuading before he agreed. Fiona, who has a polytechnic diploma in materials science, says: "My brother and I owe a lot to my father and bak kut teh. My father has worked day and night selling bak kut teh since his 20s to give us a good life. You could say bak kut teh helped to raise us." Mario agrees. "We have a lot of feelings towards bak kut teh. We want to keep the family legacy going, we want to help him grow the business," says the polite young man, who dropped out of SIM University's business degree programme after completing his second year. 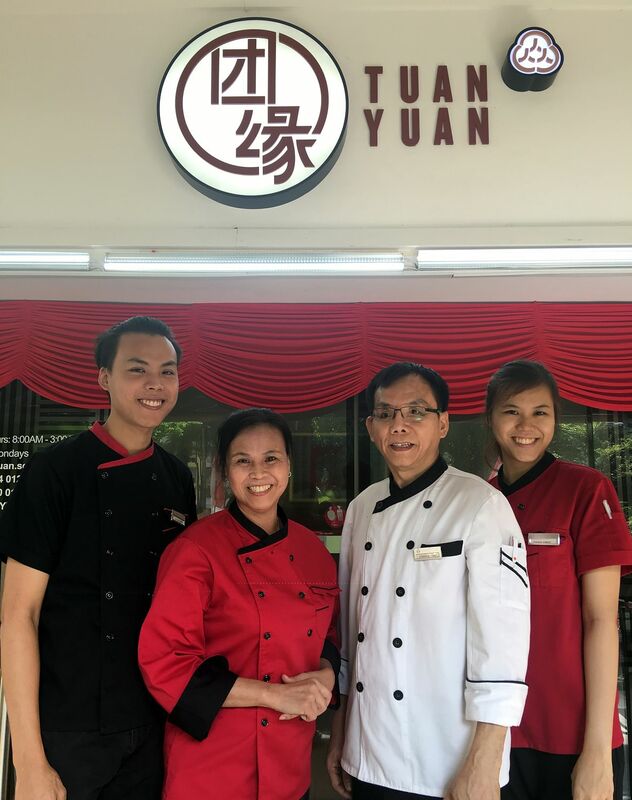 The siblings have certainly helped to modernise Tuan Yuan's operations by streamlining workflow and introducing, among other things, a phone app for customers to order their food in advance. "I dare not think so far ahead. One step at a time." "No cutting corners. Fresh meat. Good ingredients. Cooked with lots of love and care."